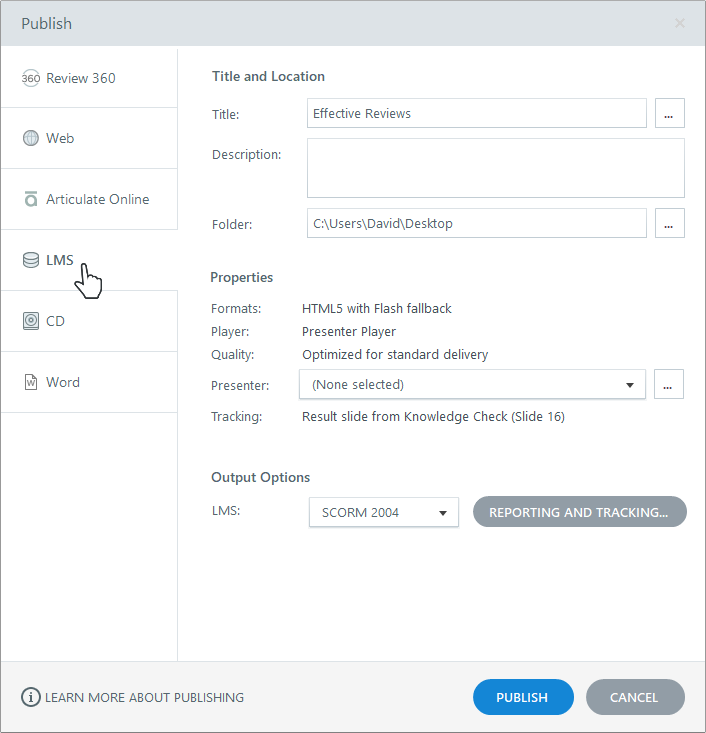 If you're using a learning management system (LMS) to track e-learning content, you'll want to use the LMS publishing option in Presenter 360. Important: Always publish to your local hard drive. Publishing to a network drive or a USB drive can cause problems with your published output. After publishing to your local hard drive, upload the output to your LMS for testing. The Identifier is a unique string of characters assigned by Presenter that your LMS uses to identify your course. If you're republishing a course that's already in your LMS, don't change the value in this field. 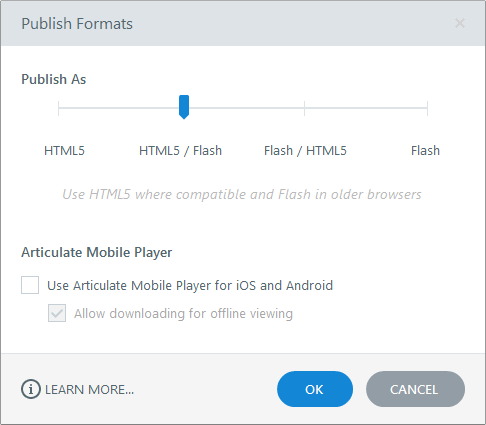 The accompanying option to Allow downloading for offline viewing isn’t currently supported for LMS content. Learners who attempt to view an LMS course offline will be prompted to reconnect to the internet. 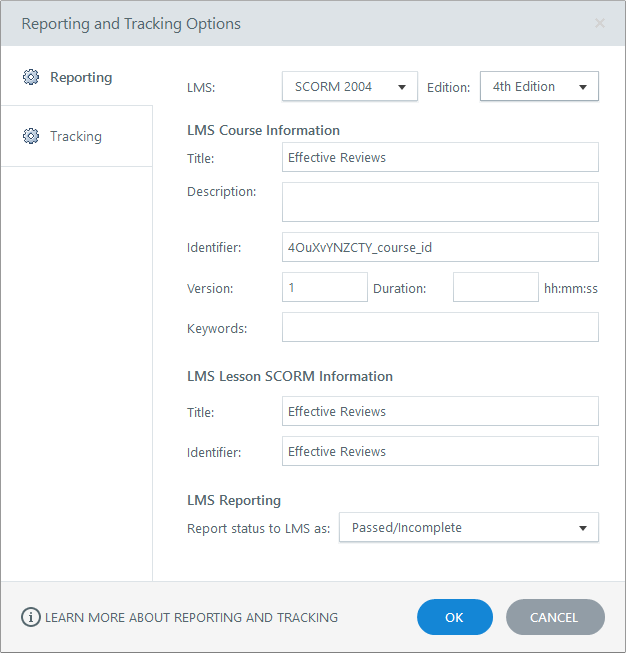 Select the Reporting tab on the left side of the window and choose a specification from the LMS drop-down. Ask your LMS administrator if you're not sure which spec to use. Presenter supports Tin Can API (xAPI), SCORM 2004, SCORM 1.2, and AICC. If you choose Tin Can API as your reporting specification, you'll see a field called Launch URL. Enter the full URL for the presentation.html file if you plan to host the content on a server that's separate from your LMS. The first Identifier is a unique string of characters assigned by Presenter that your LMS uses to identify your course. If you're republishing a course that's already in your LMS, don't change the value in this field. This opens a file viewer where you can see the files Presenter just created. There will be multiple files and folders for a published course. Tip: If your LMS requires you to identify the file that launches your course, point to index_lms.html for SCORM/AICC content or presentation.html for Tin Can API content.